A groundbreaking new history, telling the stories of hundreds of African-American activists and officeholders who risked their lives for equality - in the face of murderous violence - in the years after the Civil War. By 1870, just five years after Confederate surrender and 13 years after the Dred Scott decision ruled blacks ineligible for citizenship, Congressional action had ended slavery and given the vote to black men. That same year, Hiram Revels and Joseph Hayne Rainey became the first African-American U.S. senator and congressman respectively. In South Carolina, only 20 years after the death of arch-secessionist John C. Calhoun, a black man, Jasper J. Wright, took a seat on the state's Supreme Court. Not even the most optimistic abolitionists thought such milestones would occur in their lifetimes. The brief years of Reconstruction marked the United States' most progressive moment prior to the civil rights movement. Previous histories of Reconstruction have focused on Washington politics. But in this sweeping, prodigiously researched narrative, Douglas Egerton brings a much bigger, even more dramatic story into view, exploring state and local politics and tracing the struggles of some 1,500 African-American officeholders, in both the North and South, who fought entrenched white resistance. Tragically, their movement was met by ruthless violence - not just riotous mobs, but also targeted assassination. With stark evidence, Egerton shows that Reconstruction, often cast as a "failure" or a doomed experiment, was rolled back by murderous force. 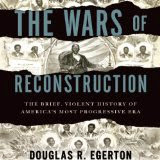 The Wars of Reconstruction is a major and provocative contribution to American history.